Sega Does’ first co-authored review! James Swift tackles the Genesis port in detail, while Dylan tries desperately to comprehend the Master System version! That’s why you don’t build castles on top of landmasses on top of volcanoes. Looking back on it, the Sega Genesis was a killer console for strategy game fans. Not only were there top-notch genre offerings like Tyrants, Cannon Fodder, Gain Ground and General Chaos, the system also gave us two games that are considered foundational texts of the modern real-time strategy game: Herzog Zwei and Dune II. And then there were the Amiga and DOS ports – most notably, Populous from Peter Molyneux and pals at Bullfrog Productions. Populous is the game that popularized the “God game” subgenre, and next to Pac-Man or Tetris, has to be one of the most ported games ever (top 20, at least). I’ve played versions of Populous on about a dozen different platforms, including the Master System, the TurboGrafx-16, the original Game Boy and the DS. The Genesis iteration is actually one of the better ways to experience the title, even if the lack of a mouse is still a big hindrance. Sorry chaps, we’re fresh out of “free will” today. At first glance, Populous appears extremely complicated. Just take a gander at all those buttons – there’s nearly 30 of them stretched out over the screen! Thankfully, the learning curve isn’t too steep, and after about an hour or so of fiddling around you’ll have a pretty solid understanding of the game mechanics. In Populous, you play a supreme being and a rather ornery one at that. You can reshape the landscape, cause volcanoes to erupt, drown the whole planet in torrential floods and make all of humanity battle one another to the death for your amusement. Alas, the world of Populous is a polytheistic one, which means you aren’t the only super powerful deity going Old Testament all over creation. The whole point of the game is to make your followers powerful enough to invade the stretches of land occupied by people who worship a different all-powerful being (described as “evil incarnate”) and convert them. And by convert, I mean massacre. Yeah, I wish this game had more cynical subtext about ethno-religious conflict, too. You begin each stage by terraforming the gamespace so your followers can build castles, armories and more. Once they’re advanced enough, you can summon a knight to rally the locals to embark upon a crusade to convert all those heathens on the other side of the overworld map. To finish the stage, you have to kick start a literal Armageddon between your worshipers and the last vestiges of the faithless. And you do this … for another 500 levels. Well done, you fleshy automatons! If you’re looking for a game with a ton of content to trudge through, this one will take you months and months to complete. The levels are large and diverse (we’ve got deserts, icy tundras and lava-encrusted mountains) and allow ample opportunities to monkey around with all of your “god powers.” If you have a penchant for slower-paced gameplay and often grueling micromanagement simulations, Populous is your game. It’s not easy being a malevolent god-king, though. The game gets repetitive fast, and even worse, it takes forever for your virtual civilizations to flourish. Don’t mistake Populous for The Sims, because there isn’t much interacting you can do with your followers. Basically, you do your best to flatten the landscape and prevent adherents from fleeing your kingdom until you have enough manpower to conquer thy neighbor. Civilization or Command & Conquer, this ain’t. There’s a finite number of things to do and the “battle system” is virtually 100 percent hands off. The graphics are pretty good (better than the Amiga version, for sure), but there’s no music, just this weird thumping chiptune heartbeat that plays throughout the title. The controls aren’t as clunky as you might think, even with the lima bean-shaped Genesis pad, although the whole soiree would be much smoother with a mouse peripheral. Also, this is a one player only affair, which means you and a pal can’t engage in any god vs. god donnybrooks. Looks like Heathen Valley to me. Overall, Populous might placate genre purists for awhile, but it just doesn’t have the variety or complexity of the console’s other strategy titles. Bullfrog Productions did up the ante with two vastly superior Genesis ports in the Populous franchise: the outstanding Power Monger and Two Tribes: Populous II, which adds way more features and nuance to the core gameplay (yet, for some reason, it was only released in Europe – go figure). If you’re the patient sort or just a gamer with some major superiority complex hang ups, there’s certainly fun to be had with Populous. Unfortunately, that fun just doesn’t seem to last. Oh come on Sega, this was never Action. Unlike James, I do not find Populous easy to grasp. Perhaps my mind just taps out at the thought of learning all those on-screen icons, or perhaps my inexperience with computer strategy games leaves me at a loss. Either way, Populous is not for me. But it does come with this insane title screen. While I’m unsure of the game’s quality, I’m surprised by how well it runs on the Master System. In flailing around with both the Genesis and Master System versions, I did not see a noticeable performance difference between the two of them. Naturally, the Genesis version looks a bit better and moves a bit smoother, but considering Populous is an ugly game to begin with, you’re really not losing much here. Your land mass is a bit smaller and your icons are in different places, but the game is otherwise the same. 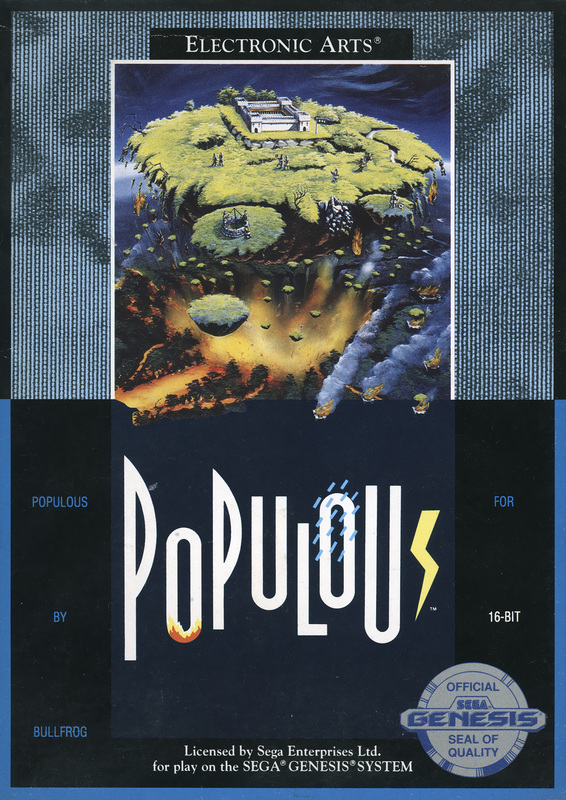 More importantly, Populous is one of the only strategy games of its kind on the Master System. Cheers if you like terraforming land and destroying other civilizations, jeers if you want absolutely anything else. I remember getting Populous for SNES back in the day and being utterly confused by it. To this day, I still have no idea how you play Populous. Glad I’m not the only one. I noticed that generally there are two types of people as far as Populous is concerned: those who consider it to be the best game ever (the ones who actually know how to play it) and all the others who are flabbergasted by this game’s intricacies. I belong in the second group as well… though I managed to grasp how it should be played more or less, many aspects of the game still seem to elude me. I feel like Populous is not as difficult as I think it is, yet difficult enough that I just can’t make it work for me. Enjoyed that review. I remember this game being raved about back in my ST days. It’s always one that I said I would come back to and learn to play, but never have. Maybe one day. The SMS game is one of my favourites. It took me a couple of games to get the hang of it but after that I remember playing it non stop for a whole day and night. I was so obsessed with it that when a friend called me that day to arrange a sleep over, after I got mum’s permission to stay at his place I forgot he was still waiting on the line and went straight back to the game. I think he waited about 45 minutes before finally hanging up. Like James says, it does get repetitive. At least the SMS version throws in a heap of new tilesets (I assume they’re unique to this version but maybe not) so among other settings you end up terraforming these ornate crystal forests inhabited by little alien things. Sorry it didn’t gel with you Dylan! Eh, that’s ok. I wish the instruction manual was online somewhere, but I couldn’t find it. That definitely would have helped. I do remember reading that there were plans to bring Populous II to the Genesis in North America (I believe it was going to be called Wrath of the Gods and was even spotlighted in an issue of Sega Visions) but never materialized.